M@ What Are The Commonest Baby Names In London, By Borough? Click/tap for slightly higher resolution. The commonest baby names in the UK for 2017 are out, from the Office of National Statistics. The top names across the country for girls are Olivia (first), Amelia and Isla. The boys are led by Oliver, Harry and George. How does the national picture compare with London? Our map above shows a fair bit of diversity across the boroughs. 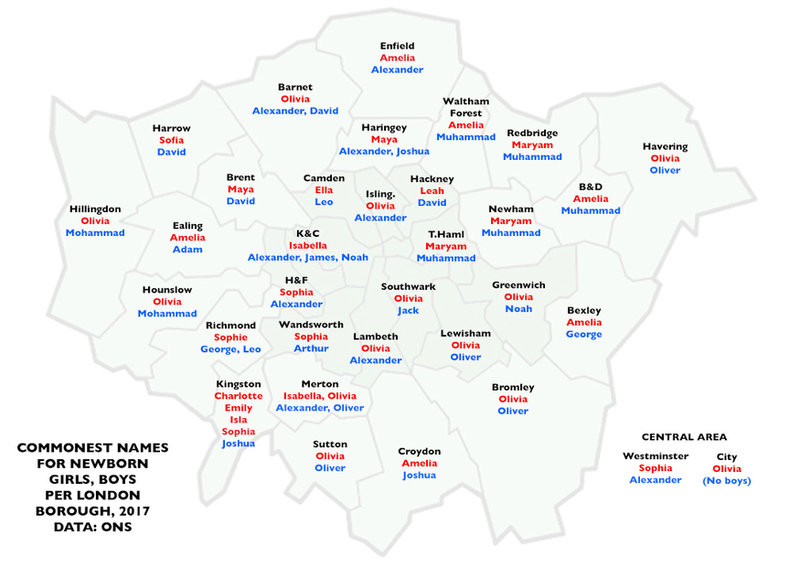 Olivia and Oliver feature strongly, appearing in 13 of the 33 local authorities, and these probably represent the top names for London taken as a whole. However, names that don't figure in the national top 10s, such as Arthur, Adam, Maryam and Maya also feature. We notice a few local resonances. Is Leah so popular in Hackney because of the neighbouring River Lea? Is it coincidence that seafaring name of Noah only champs it in the maritime borough of Greenwich? The City of London lacks data for male names — its population of just 9,000 does not procreate with enough gusto for popular names to register statistically in the survey.